I just wrote this poem a few minutes ago after I read a poem here. I found it to be very interesting and well written, and I thought I should perhaps share my perspective on some parts of the poem that spoke to me the most. and not turn from dust to rust. this is a sound saying from days of old. letting go is necessary in order to get there. if we are willing to ourselves be true and fair. 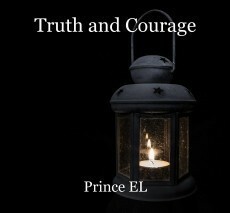 © Copyright 2019 Prince EL. All rights reserved. Nice. Letting go and having a voice is usually the key. Thank you so much for reading and for your kind feedback.